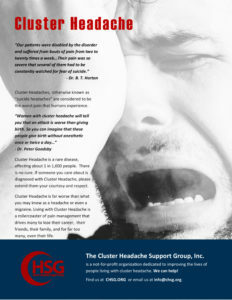 Cluster headaches (CHs) are one of the most debilitating of all the identified headache syndromes. Their pathogenesis is poorly understood, which has made their treatment challenging. Various medicines and modalities have been put forth in an effort to minimize the symptoms, but none have proven to be consistently reliable. Repeated chronic inflammation, such as under circumstances of ruptured Rathke’s cleft cyst(RCC), is known as the fundamental basis of various pathological changes including neoplastic change,therefore to examine accurate incidence of pituitary adenomas is important for the preventive medicine.